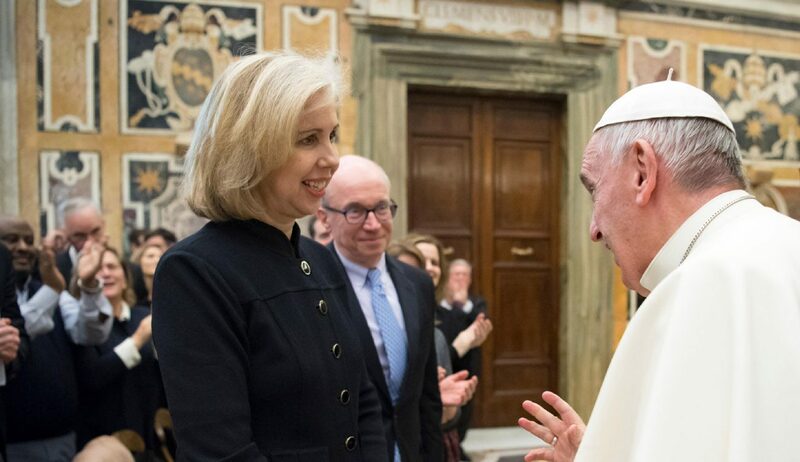 VATICAN CITY (CNS) — Pope Francis pleaded with a group of billionaires to take seriously their personal obligation to share their resources and make a real commitment to doing business in a way that helps other people realize their potential, too. “What we are speaking about is the common good of humanity, of the right of each person to share in the resources of this world and to have the same opportunities to realize his or her potential, a potential that is ultimately based on the dignity of the children of God, created in his image and likeness,” the pope told CEOs and other leaders taking part in the Fortune-Time Global Forum. Business leaders like Virgin’s Richard Branson, LRN’s Dov Seidman, Siemens’ Joe Kaeser and IBM’s Ginni Rometty met in Rome for two days to respond to what they described as Pope Francis’ “passionate pleas for broader prosperity and lasting ways to lift the poor.” They also spoke with concern of growing popular discontent with the way big business and governments operate. “Populism and protectionism are rearing their heads around the world, and trust in business — as well as other institutions — has plummeted,” the leaders said in their report to the pope. After public sessions focused on what Branson defined as “moral leadership” — “leadership that accepts that the long-term sustainability of our actions is more important than short-term gain” — the CEOs and heads of major nongovernmental organizations participated in working groups to develop practical commitments aimed at increasing people’s access to finance, health care, the internet, energy, food, clean water, education and job training. “The centrality and dignity of the human person,” especially the poor and refugees, must be the key factor in strategizing sustainable development, the pope said. “While this may create conflict and lay bare the many sorrows of our world, it also makes us realize that we are living in a moment of hope. For when we finally recognize the evil in our midst, we can seek healing by applying the remedy,” the pope said.